FREE fun craft for children. 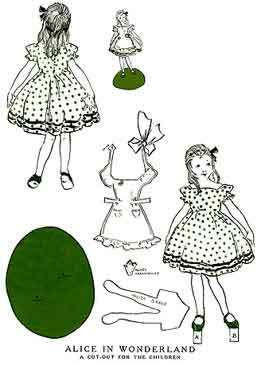 Alice in Wonderland characters printable paper dolls are reproduced from a vintage magazine. 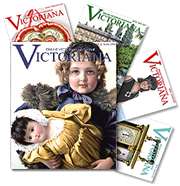 Often ladies' magazines would include a free craft for children to keep them occupied while their mothers were engrossed in the latest articles and fashions of the day. Print these free Alice in Wonderland characters printable paper dolls for a fun craft for at home or at school. Cut out the Alice in Wonderland front, back, inside brace and standard. If you paste cut-outs to heavy cardstock paper - it will make them much stronger. Also cut out the white spaces between the Alice in Wonderland arms and dress. This will give room to put her apron-strings through. Paste "inside brace" to cardstock paper, then cut card along outlines of the brace. This is to make it stronger. Now paste the brace to back of the front view of the Alice in Wonderland legs. Paste the front and the back together. Slip the Alice in Wonderland flaps A and B through slits A and B on the standard. Paste the flaps to its bottom and Alice in Wonderland will stand. With a sharp knife, make a little slit at the top of the left-hand apron pocket; this pocket will hold the Alice in Wonderland handkerchief. Fold the apron along dotted shoulder lines and paste flap D to underside of the bow. Slip the apron over the Alice in Wonderland head and bend back the waist flaps through spaces between the Alice in Wonderland arms and body. Cut out brick wall roughly, and paste it to heavy cardstock pa­per. Let this dry, and then cut out the back­ground of the gate but leave it attached to the wall at the left side. Bend the ground forward at the dotted line, and the gate backward. Paste together front ("A") and back ("B") of the Cheshire Cat. Spread the paste over the cross-lined part of "A." Fit the head and the forepaws of the Cheshire Cat on here. 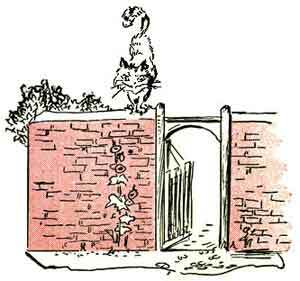 The space left between the front and the back feet of the Cheshire Cat will slip over the clump of leaves on the wall, from which point the Cheshire Cat can see the Mad Hatter's house quite clearly.